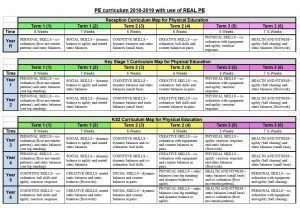 In Foundation, KS1 and KS2 PE this year we are following a PE curriculum called REAL PE. This approach is designed to provide all children with the physical literacy, emotional and thinking skills to achieve in PE, sport and life. We are being creative in how we deliver this scheme, making sure it is adapted for use within our classes. Each child will be assessed every lesson to measure their progress within six multi-ability areas: personal skills, social skills, cognitive skills, create skills, physical skills and health and fitness.